Hello friends!! I am back today with a card for the new Flashback Friday challenge. If you didn't see my earlier post today with some exciting news and the winner for my most recent giveaway, CLICK HERE. The challenge for Flashback Friday 17.0 is to post your first banner project. I scrolled back and the first one I could find on my blog was from a card from a year and a half ago.....it is still one of my favorite cards. I can't believe that it took me that long to finally use a banner on one of my projects. You can see a close up of the card plus all the details on my original post HERE. I would like to wish Amy from Flashback Friday Challenges a very Happy Blogaversary!! We have been blogging friends for a long time. Maybe one day we will get a chance to meet in person. =) Thanks for stopping by!! 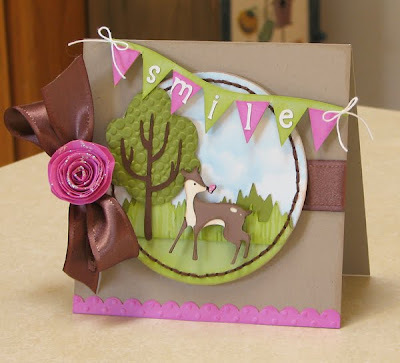 What a beautiful and happy banner card, Amy! Thanks for joining in the fun at Flashback Friday 17.0. Thanks soooo much for playing with us Amy!!!! That is such a cute card! great banner and love that little deer! Hey Hey...thanks for linking up! I've featured you today on the FBF blog!